Back in February Flourish Sussex Flower School collaborated with a number of talented business women to create a fashion and floral photo shoot. I am a big believer in supporting other women in business and it was such a great experience to bring these ladies together and create a shoot that showcased our work. Gill East is a makeup artist and hair stylist, Emily Webster is a very talented stylist, Lucy Webb is a costume designer, Jessica Wong has a background in publishing and Bryony Creed runs her own nursery and was our model for the shoot. The aim of the photo shoot was to look at different bridal styles and combine them with our influences and the latest trends in our fields. The first shot presented bridal elegance. The dress was fitted with a lace body and a tulle skirt all made by Lucy Webb. Her hair was curled, down and natural. For the flowers I used a combination of warm peaches, pinks, creams and a splash of yellow. The flowers were designed to give a warm feeling which complimented Bryony's complexion. The urns and the bouquets were all free flowing, allowing flower movement to take place. I used a combination of English roses, ranunculus, carnations and seasonal foliage to create the designs. Our ballerina shot show cased girly romance with a touch of glamour. The dress had a lace bodice and a large tulle skirt all designed and made by Lucy Webb. The flower content was designed to be bright and colourful. Combining magenta, coral, wine, violet, peach, yellow, cream together to create a truly opulent look. All the urns were created using floral frogs or chicken wire and were completely foam free. I used a combination of roses, carnations, orchids, anemones, berries, ranunculus and blossom to create the displays. Her hair was tied in a top knot, all designed to reflect the look of a ballerina. This winter shot ,which turned out to be my favourite shot of the day, was inspired by Swan Lake. I had the idea to create two arrangements one representing the white swan and the other representing the black swan. The flowers were designed to drape over the fireplace and entangled together to represent the conflict in the Swan Lake story. 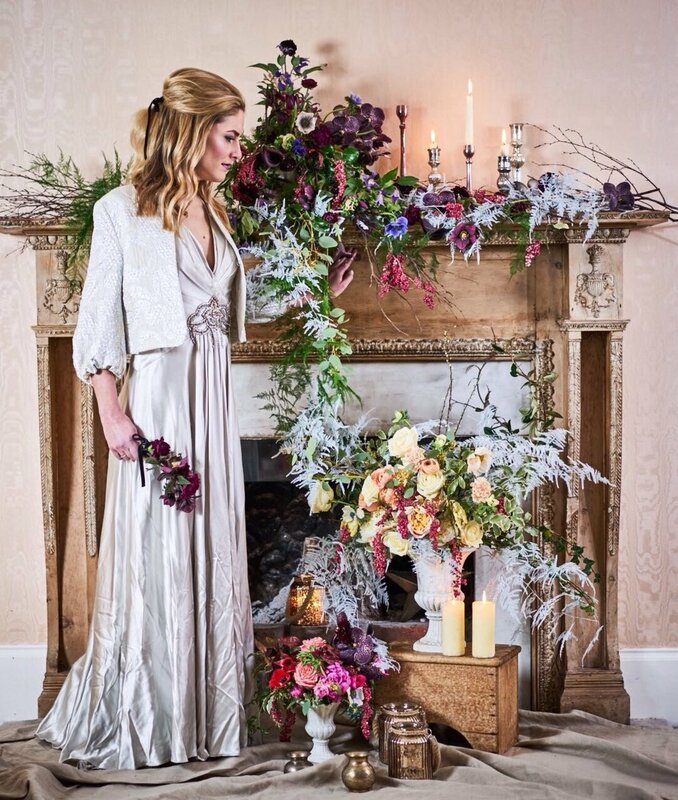 Emily Webster styled the shot with candles, lace and vases to reflect the idea of winter. Bryony wore a Jenny Packam wedding dress. Her hair was curled and designed to be half up and half down with a black bow. This was such a great experience and I am so thankful to everyone involved in creating the set of lifestyle shots. A special thank you to Becca for letting us use her beautiful home and to Pete Webb our photographer for capturing the beautiful moments.